John Milton, known as Jack, was born in the spring of 1881 at Portsmouth, Hampshire, the son of James Milton (1846-1931), originally from Uffculme, Devon, and Keziah née Purchase (1845-1914) originally from Hardington. James was a Colour Sergeant in the Royal Marines Artillery and consequently he and Kezia moved around a lot during their early marriage as evidenced by the birthplaces of their children: William Charles (b1870, Hardington), Robert James (b1872, Hardington), George (b1874, Evershot), Charlotte (b1876, Evershot), Susan Elizabeth (b1880, Portsmouth), John, Edith Rose, known as Rose (1882, Portsmouth -1960), Joseph (b1883, Portsmouth), Thomas (1885, Yeovil -1918), Samuel (1887, Yeovil -1961), Charles (b1889, Yeovil) and Charlotte Ruth (1897, Yeovil -1898). As seen above, the family appear to have settled in Yeovil from around 1885 when James left the army. In the 1891 census the family were listed at 1 Beaconsfield Terrace, St Michael's Avenue, and James gave his occupation as a steward in a club (actually the Ivel Club in Frederick Place). The family were still at this address by the 1901 census although 20-year old Jack had left home by this time (see below). During the winter of 1906, at Yeovil, Jack married Lilian Ethel Maud Newman (b1884, Amesbury, Wiltshire). 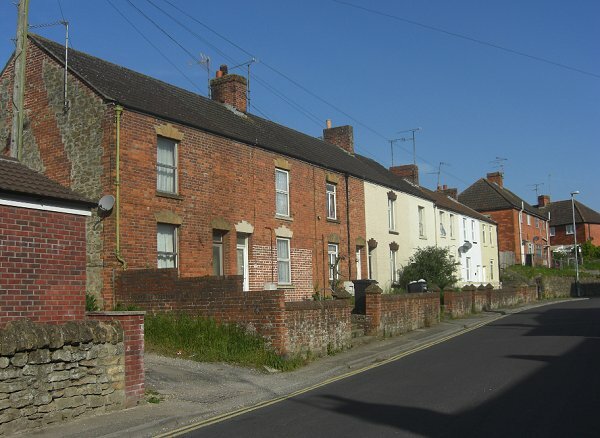 They initially set up home in Yeovil where their first daughter, Lilian, was born in 1908. By 1910 they had moved to Mardy, Glamorgan, where their next children were born; Beatrice (b1910) and John J N (b1911). By the time of the 1911 census the family was living at 3 Pit Huts, Pontypridd Water Works, Mardy, Glamorgan. 30-year old Jack was employed as a colliery banksman (screenman) - an above-ground job at the colliery. Jack enlisted at Taunton although the date is unknown. However his brief obituary noted that at the time of his death he had served sixteen years with the Colours, indicating an initial enlistment during 1901 (which probably accounts for why I couldn't find him in the census). He initially served in the Corps of Dragoons with the Service Number 4346. Details of his early military service remain mostly unknown although it is known that he served in the South Africa Campaign. Jack would have been on the reserve list and was called up at the outbreak of war in 1914. At some point, possibly on re-enlistment, he joined the 15th (2nd Birmingham Pals) Battalion, Royal Warwickshire Regiment. This battalion was raised in Birmingham in September 1914 by the Lord Mayor and a local committee. After training they joined 95th Brigade, 32nd Division on 26 June 1915. They proceeded to France, landing at Boulogne on 21 November 1915. On 28 December 1915 they transferred to 14th Brigade, 5th Division, one of many units that were exchanged to stiffen the inexperienced 32nd Division with regular army troops. On 14 January 1916 they transferred to 13th Brigade, still within 5th Division. In March 1916 5th Division took over a section of front line between St Laurent Blangy and the southern edge of Vimy Ridge, near Arras. They moved south in July to reinforce The Somme and were in action at High Wood, near Bazentin le Petit in the Somme département of northern France. The fighting continued immediately with the Battle of Guillemont (3–6 September 1916) which was an attack by the Fourth Army on the village of Guillemont. The village was on the right flank of the British sector, near the boundary with the French Sixth Army. The Fourth Army had advanced close to Guillemont and the capture of the village was the culmination of British attacks. The attacks were intended to advance the right flank of the Fourth Army and eliminate a salient further north at Delville Wood. Jack's battalion was then, almost immediately, involved in the Battle of Flers-Courcelette - a battle, within the Somme Offensive, launched on 15 September 1916 with the battle continuing for a week. Flers–Courcelette began with the objective of cutting a hole in the German line by using massed artillery and infantry attacks. This hole would then be exploited with the use of cavalry. It was the third and final general offensive mounted by the British Army during the Battle of the Somme. By its conclusion on 22 September, the strategic objective of a breakthrough had not been achieved; however tactical gains were made in the capture of the villages of Courcelette, Martinpuich and Flers. In some places, the front lines were advanced by over 2,500 yards (2,300 m) by the Allied attacks. The battle is significant for the first use of the tank in warfare. Within a couple of days, the battalion was in action again. The Battle of Morval, 25–28 September 1916, was an attack during the Battle of the Somme by the British Fourth Army on the villages of Morval, Gueudecourt and Lesbœufs held by the German 1st Army, which had been the final objectives of the Battle of Flers–Courcelette. The main British attack was postponed, to combine with attacks by the French Sixth Army on the village of Combles south of Morval, to close up to the German defences between Moislains and Le Transloy, near the Péronne–Bapaume road. The combined attack from the Somme river northwards to Martinpuich on the Albert–Bapaume road, was also intended to deprive the German defenders further west near Thiepval of reinforcements, before an attack by the Reserve Army, due on 26 September. The postponement was extended from 21–25 September because of rain, which affected operations more frequently during September. Combles, Morval, Lesbœufs and Gueudecourt were captured and many casualties inflicted on the Germans. Just a week later the battalion was in action again. The Battle of Le Transloy began in good weather and Le Sars was captured on 7 October. Pauses were made from 8–11 October due to rain and 13–18 October to allow time for a methodical bombardment, when it became clear that the German defence had recovered from earlier defeats. Haig consulted with the army commanders and on 17 October reduced the scope of operations by cancelling the Third Army plans and reducing the Reserve Army and Fourth Army attacks to limited operations in co-operation with the French Sixth Army. Another pause followed before operations resumed on 23 October on the northern flank of the Fourth Army, with a delay during more bad weather on the right flank of the Fourth Army and on the French Sixth Army front, until 5 November. Next day the Fourth Army ceased offensive operations except for small attacks intended to improve positions and divert German attention from attacks being made by the Reserve / Fifth Army. Later in October 1916 the 15th Battalion moved to Festubert and remained there until March 1917 when they moved in preparation for the Battles of Arras. The Battle of Arras (also known as the Second Battle of Arras) was a British offensive on the Western Front. From 9 April to 16 May 1917, British troops attacked German defences near the French city of Arras. The British achieved the longest advance since trench warfare had begun although the advance slowed during the next few days and the German defence recovered. The battle became a costly stalemate for both sides and by the end of the battle the British Third and First armies had suffered about 160,000 casualties and the German 6th Army 125,000 casualties. On 7 September 1917 the 5th Division moved out of the line for a period of rest before being sent to Flanders where they were in action during the Third Battle of Ypres. The Third Battle of Ypres (or the Battle of Passchendaele) was a campaign fought by the Allies against the German Empire. It comprised a whole series of battles that took place on the Western Front, between July and November 1917, for control of the ridges south and east of the Belgian city of Ypres in West Flanders. Passchendaele lay on the last ridge east of Ypres, five miles from a railway junction at Roeselare, which was a vital part of the supply system of the German Fourth Army. Although we do not know in which specific actions within the Battle of Passchendaele Jack played a part, he was killed in action on 26 October 1917. He was 36 years old. In its edition of 30 November 1917 the Western Gazette reported "Mr John Milton, steward of the Ivel Club, has received the sad intelligence that his son, Jack, a private in the - Warwickshire Cavalry, has been missing for a month. Private Milton has been in France since the outbreak of the war, during which he has twice been on a short home leave. Private Milton, who has a wife and four children, is 36 years of age, and has seen 16 years service with the Colours." Jack's brother Thomas was killed in Italy on 30 October 1918, just two weeks before the end of the Great War. 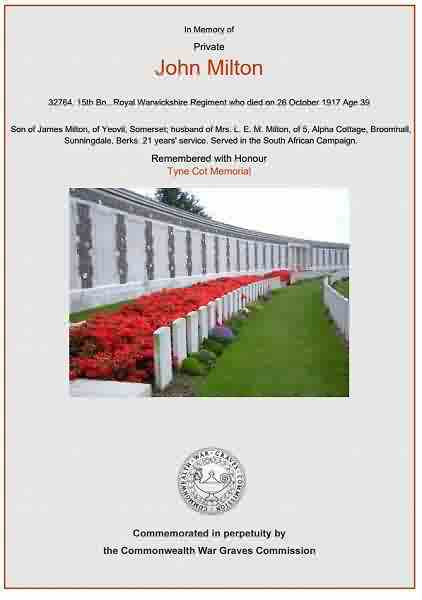 John 'Jack' Milton's name is inscribed on the Tyne Cot Memorial, Panel 23 to 28 and 163A, and his name is recorded on the War Memorial in the Borough. The Commonwealth War Graves Commission certificate in memory of John 'Jack' Milton.